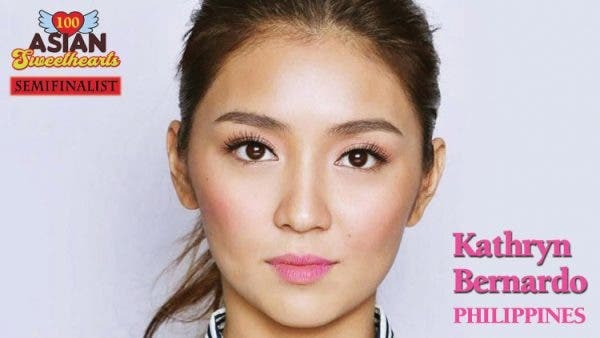 Congratulations Kathryn Bernardo of the Philippines for making it through the semifinals of 100 Asian Sweethearts by winning the global fan vote in Group 2. The 22-year-old star of the drama series “La Luna Sangre” and “The Promise” will advance in our Top 30 poll which is happening this August so please stay tuned. For the meantime, please vote for the remaining nominees in group 4 to 14 HERE. Kathryn is so sweet,innocent & beautiful. Kathryn Bernardo always Beuatiful lady inside &out! 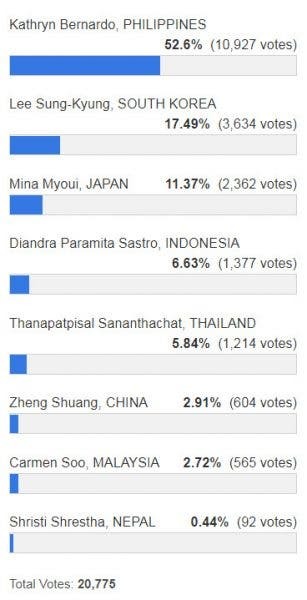 Queen Kathryn all the Way…Multiple talented Queen,the real Queen Of Box Office n Asian Showbiz..we Nigerians Love you so much…more Votes in the next Round,can’t wait..